The iron scow in the Niagara River. It has officially been 100 years since the iron scow (or “Old Scow”) wreck in Niagara Falls, and Niagara Parks will be honouring this event with a new plaque to be unveiled on August 6th 2018. The iron scow has become a historic Niagara Falls landmark and the story of how it got there is worth revisiting on the centenary of the event. On August 6th, 1918, a small dumping scow carrying two men was dredging up sandbanks on the Niagara River, upstream from the brink of the Canadian Horseshoe Falls. The scow broke loose from the tugboat that was meant to bring it back to shore approximately 1.6km up-river from the Falls, and began heading towards the edge of the mighty waterfall. 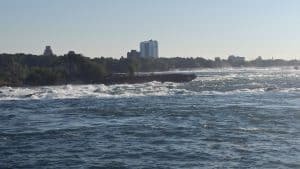 While travelling down-river the scow got caught on a rock shoal just 838 yards from the waterfall’s edge, leaving the two men stranded in the Niagara River’s turbulent upper rapids. This set off a dramatic rescue mission as a rescue boat couldn’t reach the two men. Eventually, the U.S. Coast Guard shot a line from the Toronto Power House to the barge and the men were brought back to shore using a breeches buoy rescue device. While the two men made it safely back to shore after the incident, the iron scow still remains stuck in the Niagara River today. It’s just a short distance away from the brink of the Horseshoe Falls and has become a well-recognized landmark. You can join Niagara Parks in honouring this historic Niagara Falls event on August 6th, 2018 at the old Toronto Power Generating Station from 7-8pm. Make it a part of your extraordinary Niagara Falls getaway this summer!